My voice became so powerful that dangerous men tried to silence me. But they failed. When Little M first read this book, she was too young to understand it, but last year she wanted to know what happened to Malala. After mulling this over, we decided to tell her and thankfully she was okay with it. However others might want to wait a little longer. Although this has been designed for 4-8 year-olds, it covers challenging themes which might concern some children. If you think your child can deal with this aspect then Malala’s Magic Pencil is an essential for your family bookcase. Truthfully it’s not one we would have necessarily picked ourselves (we were given it by a friend), but we’re really glad that it’s now part of our book collection. It’s widened Little M’s world in a gentle way and has showed her the power of speaking out. 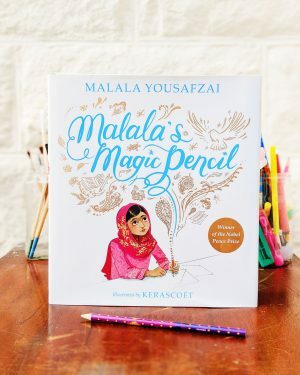 Thanks to Malala, she now has her own magic pencil too.